Liholiho was born circa 1797 in Hilo, on the island of Hawaiʻi, the eldest son of Kamehameha I and his highest-ranking consort Queen Keōpūolani. His birth name was Liholiho and full name was Kalaninui kua Liholiho i ke kapu ʻIolani. It was lengthened to Kalani Kaleiʻaimoku o Kaiwikapu o Laʻamea i Kauikawekiu Ahilapalapa Kealiʻi Kauinamoku o Kahekili Kalaninui i Mamao ʻIolani i Ka Liholiho when he took the throne. Liholiho had five wives, Kamāmalu, Kekāuluohi, Kalanipauahi, Kekauʻōnohi and Kīna‘u; he had no children with any of his wives. Kamehameha II is best remembered for the ‘Ai Noa, the breaking of the ancient kapu (taboo) system of religious laws six months into his reign when he sat down with Kaʻahumanu and his mother Keōpūolani and ate a meal together. The religious and political code of old Hawai‘i, collectively called the kapu system, was abolished. While the islands were united by his father, after the abolition of the kapu, Keaoua Kekuaokalani (Liholiho’s cousin) led the forces supporting the ancient Hawaiian religion; Kekuaokalani, his wife Manono and his warriors were overwhelmed. Lekeleke Burial Grounds, 7 miles south of Kailua, commemorates the battle. Sandalwood was an important export at the time. 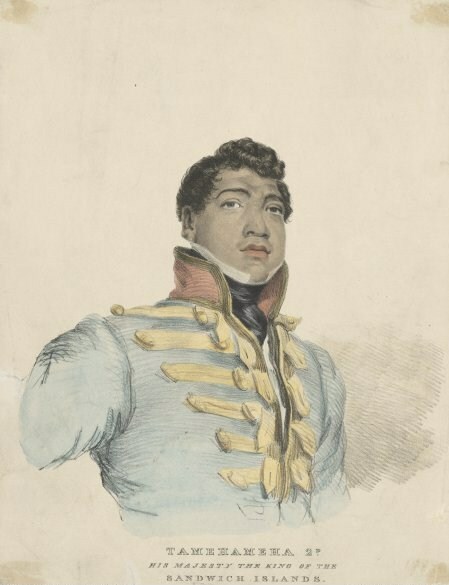 In 1819, Liholiho ended the controls on harvesting ‘iliahi initiated by his father. In their rush to collect wood, the chiefs ordered even young trees to be cut down. New trees were not planted to replace those cut down. Soon there was little ʻiliahi worth gathering in Hawaiʻi. As the supply dwindled the trading of ʻiliahi came to an end. On April 4, 1820, the initial group of missionaries came to Hawai‘i and Liholiho granted them permission to stay in the Hawaiian Islands. Later, in 1820, Liholiho bought a Royal Yacht known as Cleopatra’s Barge in exchange for reportedly 1-million pounds of sandalwood; he renamed the yacht Ha‘aheo o Hawaii (Pride of Hawaiʻi). Whaling soon replaced the sandalwood trade of ʻiliahi wood in economic importance. It lasted about fifty years, from 1820 to 1870. During this time Hawaiʻi provided support services to the whaling ships; people grew crops and sold fresh fruits, vegetables and salted-meat to the ships. Liholiho’s reign was also noted for his efforts to ensure the lasting independence of the Hawaiian kingdom. In 1823, Liholiho and his favorite wife, Kamāmalu, sailed to England to meet with King George IV, the first Ali‘i to travel to England. King George IV scheduled a meeting for June 21, but it had to be delayed; Liholiho and Kamāmalu became ill. The Hawaiian court had caught measles, to which they had no immunity. It is believed they probably contracted the disease on their visit to the Royal Military Asylum (now the Duke of York’s Royal Military School). On the 8th of July the Queen died at half-past six in the evening from inflammation of the lungs. A few days later, King Liholiho died. His reign was approximately 5-years. The Sacred Mound (previously a stone mausoleum) – Pohukaina – was constructed in 1825 to house the remains of Kamehameha II (Liholiho) and his consort, Queen Kamāmalu. Then upon their arrival back to Hawai‘i, in consultation between the Kuhina Nui, Ka‘ahumanu, and other high chiefs, and telling them about Westminster Abbey and the underground burial crypts they had seen there, it was decided to build a mausoleum building on the grounds of the royal palace. The mausoleum was a small eighteen-by-twenty-four foot Western style structure made of white-washed coral blocks with a thatched roof; it had no windows. For the next forty years, this royal tomb and the land immediately surrounding it became the final resting place for the kings of Hawai‘i, their consorts and important chiefs of the kingdom. The image shows Liholiho, King Kamehameha II, in 1824 while in London, just before his death. In addition, I have included other related images in a folder of like name in the Photos section.